Crossing Over 2009 ended yesterday, but lives on in the interweb. Here is a slide show of some of the works in the show. If you haven’t seen the awesome work put out by UWM students in the Crossing Over show, go! The show closes Friday at 5pm. Cosponsored by Peck School of the Arts, Department of Visual Art. 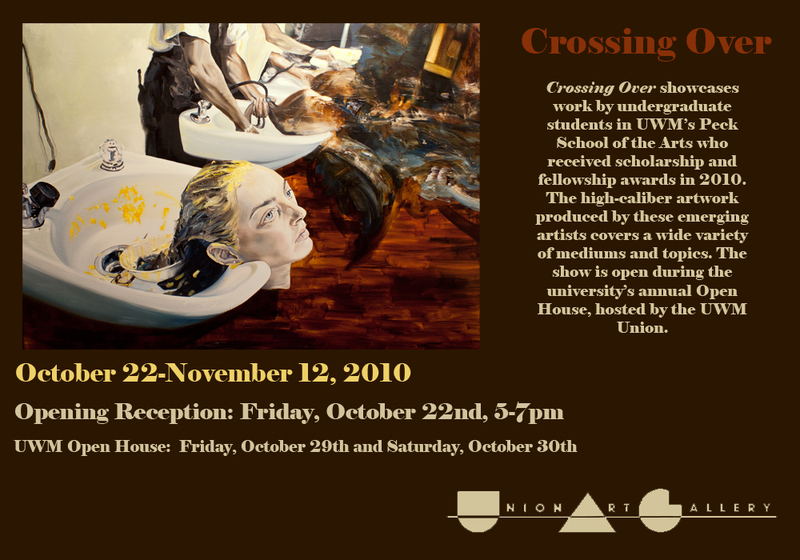 Crossing Over showcases work by undergraduate and graduate students in UWM’s Peck School of the Arts who received scholarship and fellowship awards in 2009. The high-caliber artwork produced by these emerging artists covers a wide variety of mediums and topics. The show is open during the university’s annual Open House, hosted by the UWM Union. Movimentos is coming down today and Crossing over is going up tomorrow. All students in the Crossing Over show need to bring in a Loan Agreement form and a Work Entry form. If anyone has questions about what these are don’t hesitate to email us. We will be open until 6 today and 10-6 tomorrow (saturday 17th) for dropping off work.